We believe hearth inspections are best performed by individuals who carry all three industry certifications and continue to educate themselves with the ever changing knowledge available within the industry. The “F.I.R.E. Certified Inspector credential," is aimed specifically at the inspection, requiring 48 hours of both hands on and classroom training. The "CSIA Certified Chimney Sweep Credential," exposes students to a foundation of education relating to the overall job function of being a chimney sweep. This job function includes awareness of the industry standard regarding hearth inspections, service, repair of hearth systems and health safety practices in performing these tasks. The "NFI Certified Specialist credential," test on detailed knowledge of appliance placement, fuel source knowledge and further awareness of the necessity of hearth inspections as it relates to the installation of modern hearth appliances. The inspection and evaluation of chimneys is an important service offered by Brooks Chimney Sweeping. Chimney inspections come in many forms and you should be aware that not all inspections are alike. At Brooks Chimney Sweeping, we follow the National Fire Protection Association (NFPA) required inspection procedures. It is important to point out that NFPA has no qualification mandated for whom can perform inspections. This being said, its best to contract with the most professional, educated, informed and well represented inspector in your area. NFPA divides the inspection procedure into three categories, or levels. 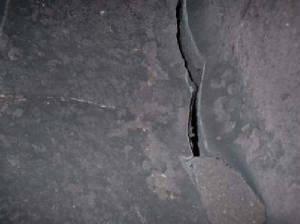 The circumstances which give rise to the inspection determine what level of inspection is to be conducted. A Level I inspection is the most basic level of inspection while Level II and Level III inspections are progressively more detailed and comprehensive. A Level I inspection is offered during each chimney sweeping. A Level I inspection is limited to readily accessible portions of the venting system, and accessible portions of the connected appliance(s) and the chimney connection. The inspector will check the readily accessible portions of the chimney, its enclosing structure, and the flue. A Level I inspection includes verification that the flue is not blocked or significantly restricted. Replacement of an appliance with one of dissimilar type, input rating or efficiency. Prior to a flue relining. Upon sale or transfer of the property. 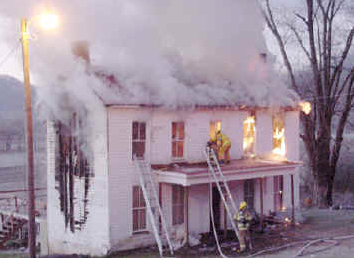 After an event likely to have caused damage to the chimney, such as a chimney fire or other sudden occurrence event. While the Level II inspection is a rather thorough inspection and requires access to many areas of the building, it does not require removal of permanent parts of the building, such as siding, chase covers or wall coverings. A Level III inspection is the most detailed of all of the inspection types and includes inspection of concealed areas of the building. However, examination of concealed areas will be limited to areas reasonably suspected of containing hazards that cannot be evaluated otherwise. A Level III inspection includes all areas covered in a Level I and Level II inspection, and inspection of concealed areas to investigate known or suspected problems. In as much as certain portions of a Level III inspection require destructive action to the building, the inspector will discuss these areas with the building owner prior to the inspection. Extreme result of a flue fire. After any unusual, or sudden occurrence event, such as a chimney fire, lightning strike, or earthquake. Prior to purchasing a home with an existing chimney. Whenever changes are made to a chimney or vent system, including replacement of connected appliances. Prior to major system repairs. A video scan is where we use a camera system which is lowered into the chimney (or pushed up from the bottom). 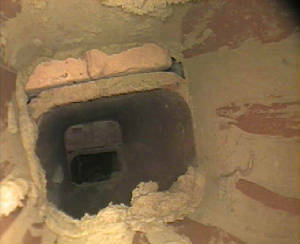 The camera allows us to inspect the chimney from a range of just a few inches instead of just looking from the top or bottom. The camera image is viewed on a TV monitor by the inspector. Video inspections may be recommended if the customer or sweep suspect certain problems. Video inspections are often recommended after a chimney fire or some other form of damage to a chimney, and are a routine part of a Level II or Level III inspection. You should be aware that even the most thorough inspection will not reveal all problems. Some areas of a chimney simply are not assessable due to construction of the house. Be sure to discuss any specific concerns with your service technician. The recommended inspection technique will often be based on your comments and concerns. Our technicians are trained to perform the appropriate level of inspection based upon the use of the chimney and any performance problems or safety concerns using the NFPA 211 as our standard. Brooks Chimney Sweeping has an inspector certified by FIRE, CSIA and NFI.